Hello everyone! I hope everyone out there is having a great summer in the northern hemisphere—and a fine winter down south. It’s time for another update of what’s going on behind the scenes here at Ektoplazm. First up, last summer I had to close the Ektoplazm t-shirt shop after the manufacturer I had been working with discontinued the service. Since then I have tried several alternatives but none really satisfied until I discovered Redbubble. 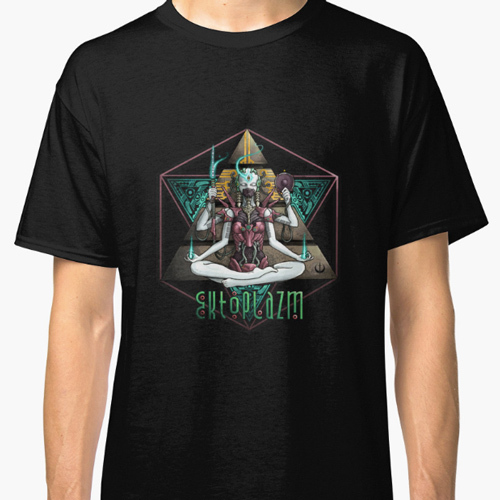 So, I am happy to announce that Ektoplazm t-shirts are once again available, albeit from a different supplier—which means different garments, print quality, and so on. They aren’t exactly the same t-shirts but based on what feedback I’ve received the quality is comparable so I encourage everyone to check out the new Ektoplazm t-shirt shop on Redbubble! By request I have also opened a page for Ektoplazm on Patreon, a web site that makes it easy to support content creators, movers, and shakers. For years Ektoplazm has accepted donations via Paypal and Bitcoin but this approach isn’t particularly transparent. Since people don’t know how much it costs to operate and develop Ektoplazm nor how much money is coming in it isn’t uncommon for there to be a shortfall that I end up covering out of my own pocket. Patreon offers the potential for more transparency. Here I will be able to set funding goals and everyone will be able to see how much support the project receives. At the very least, having Ektoplazm’s monthly web hosting expenses covered would be a great first step! People sometimes joke that if everyone who downloads from Ektoplazm chips in a dollar or two I wouldn’t have money problems any more but there’s more than a little truth to that—and Patreon makes it possible. If you support free music and my ongoing work on Ektoplazm 2.0 please feel welcome to make a pledge! Finally, a word for my label and artist partners: these days I am only accepting a limited number of new applications with several conditions outlined on the distribution policy. I regret having to make these changes but I am limited in how much I can work on the project at the present time and being more stringent with what applications I accept will allow me to help more labels and artists than I would be able to otherwise. I am trying to devote more of my time to the redevelopment effort. Feel free to hold back as your releases will still be welcome when the site moves to more of a self-serve model. You are welcome to drop me a line and talk about it if you have any questions or concerns. Thank you for your understanding! And thanks to everyone else for your continued support. That’s all for this time and stay tuned for more great music from Ektoplazm! And https://archive.org/ is always there for hosting free media on gbit/s. A bit off-topic: Sorry. Maybe there’s a better way to bring up a discussion on this, but I was wondering if you would want to encourage producers to submit NI Stems format on Ektoplazm? DJ Celteric: stems might be an option later on… but I’ve got a lot of work to do before then and don’t want to complicate the current system any further. The reason releases from bittorrent have issues is actually not bittorrent, it’s just that ppl just do half hassed releases; think of how many fake releases there are for mainstream movies. The thing I like of ekto is the high quality releases, both in good music and audio quality (lossless), well organized and simple. If basilisk goes the torrent way I think it would be more work for him with little gain if he has a real unmetered connection for the releases. Well, my suggestion was meant as addition to the direct downloads, not to replace them. Hi, for a youtube video with monetization enabled i look for dark psy. Has Ektoplazm any dark psy or psy trance releases, published for commercial usage, or which grant usage for commercial use on YouTube? Thanks! Thanks basilisk, pledging tonight! Buying shirt this week! Making a compilation for fellow anti nuke activists featuring ektoplazm downloads, so will be donating once it’s made..
OK- I just want to say that ‘MIE GOD’ I love what your doing. I love this site. I love the way it’s educated and enabled me to find music that I like with SUCH HIGH QUALITY. I was able to listen and listen and HONE my musical tastes, in ways I might never have been able to otherwise. It’s enriched me. I am a music lover of all types – but have been on a two year plus adventure in the PSY trance world and do not see myself drifting from it any time soon. Hey bud, only just found this post. Really pleased that you found RB for t-shirts, hoodies and acrylic blocks. It’s easy to get stickers done via the site also. I was going to suggest the site last year but having had so many personal hurdles to jump I just never got around to it. I am so glad you found it and will definitely be ordering some more clothes. Thanks for the note to feel free to hold back releases, takes some of the pressure off. Also good to see you making use of Patreon, it seems to be doing a lot of good for many of us creative types recently.